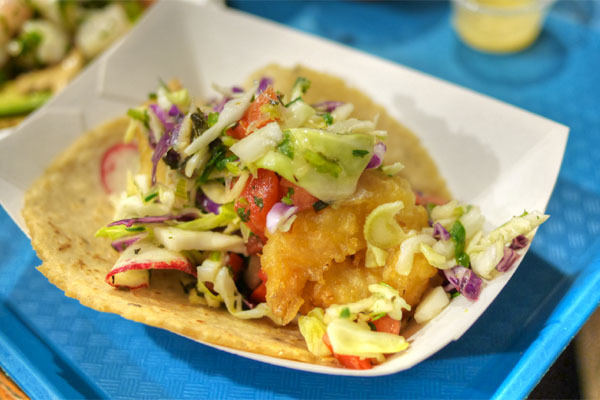 A yearning for Westside tacos brought us to Tacos Punta Cabras, which comes to us courtesy of longtime Los Angeles area chefs Josh Gil and Daniel Snukal, the duo known for underground dining series Supper Liberation Front and their work with Secret Event Services. 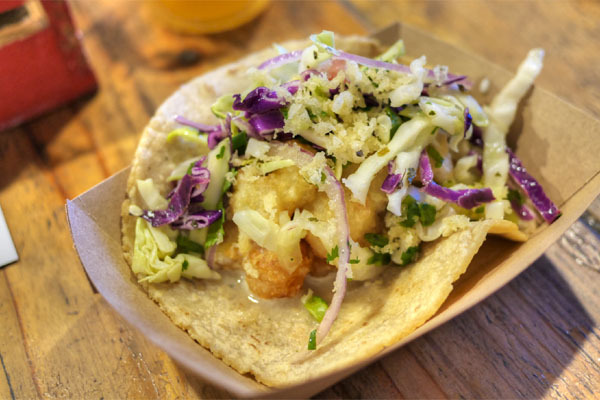 Named after "Goat Point," one of the chefs' favorite Baja surf spots, the restaurant opened back in February 2013, a super casual joint serving seafood-focused tacos, tostadas, cocktails, and the like. About the Chefs: A California native, Joshua Gil got into food at a young age, helping his mother craft Mexican meals in the family kitchen. A self-taught chef, he first began making a name for himself at the Hotel Laguna in Laguna Beach as CdC. However, his first major exposure to the LA dining scene came in 2005, when he took the reins over at the longstanding Joe's in Venice, which even scored a Michelin star under his watch. Gil stayed there until October 2007 (he was replaced by Michael Bryant), then transitioned to the Jonathan Club, where he resided until May 2009. 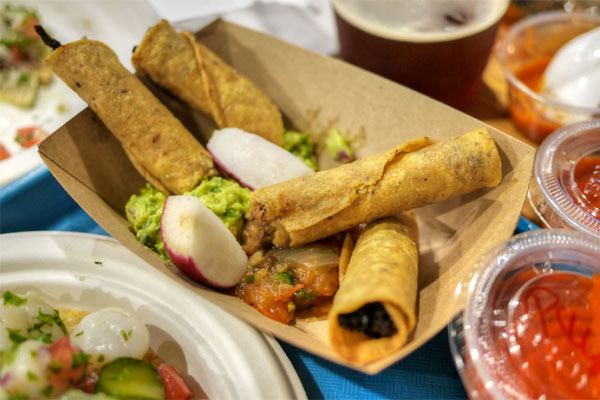 He co-founded the Supper Liberation Front at the start of 2010, and later that year, it was announced that he'd be partnering up with Guelaguetza's Bricia Lopez to launch an Oaxacan eatery called Mitla in Palms (in a space that once held an outpost of Guelaguetza, now a Beard Papa's). That plan ultimately fell through however, and Gil ended up at the Inn of the Seventh Ray in Topanga. In December 2011, he landed at Laurent Tourondel's WeHo outpost of BLT Steak (which turned into Rare by Drai's, also closed) as Executive Chef, and later moved to Herringbone at the Mondrian last April, replacing Anthony Sinsay. Dan Snukal, meanwhile, hails from Canada, and is also a self-taught chef. He started his LA career as a caterer and private chef before launching 3 on Fourth in the old Rocca space in Santa Monica (now the site of West 4th & Jane). 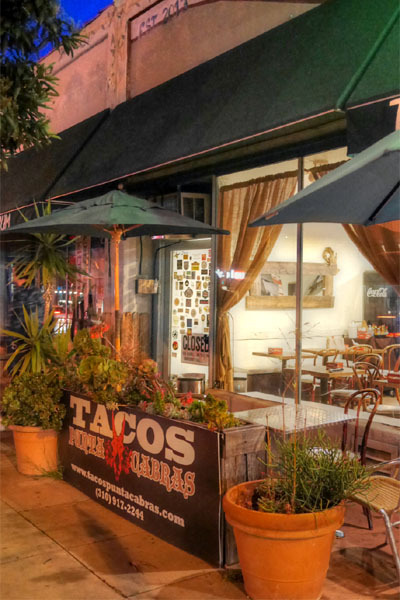 The restaurant was a partnership with his brother Joshua, and opened in May 2006 as an "international tapas" sort of place, blending American, European, and Japanese influences. It never really hit its stride though, and shuttered in March 2009. Snukal later underwent a series of stages, including stints with Masayoshi Takayama, Pierre Gagnaire (both in Las Vegas and in Europe), and Hiroyuki Urasawa right here in Beverly Hills. From there, he went to work for Ludovic Lefebvre at LudoBites, and also cooked at Obika Mozzarella Bar. Inside, it's a small, beachy, counter-ordering affair, apropos for the concept at hand. 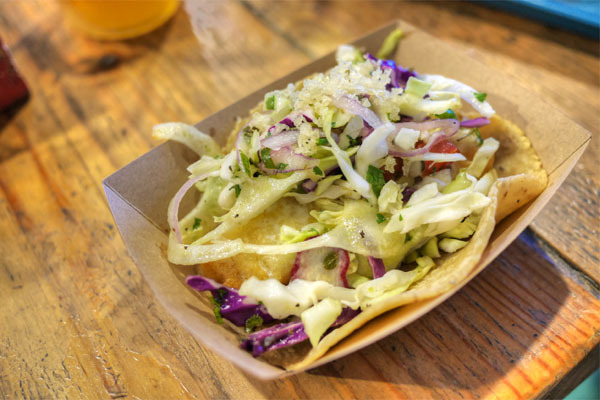 Of course, we had to start with a fish taco, done up here with housemade crema, slaw, and a lime vinaigrette. It was pretty classic at its core, and tasty too, with the crisp, yet tender fish pairing swimmingly with the bright crunch of the veggies while crema tied it all together. Given that I was expecting some fried florets, this turned out much better than I thought it would. 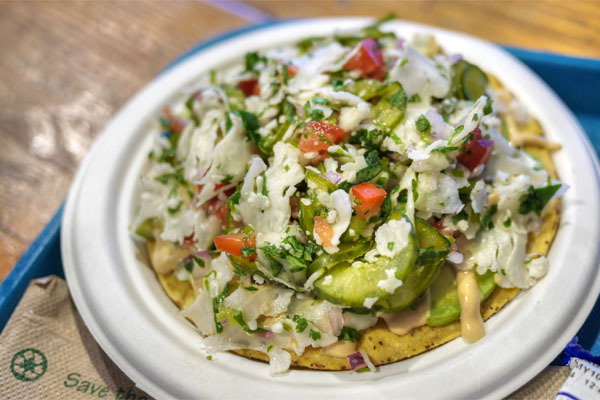 Shaved super thin, the cauliflower's delicate flavors paired well with the balance of creamy avocado and zippy acidity here, making for a lovely eating experience, especially with the crunch of that tostada. 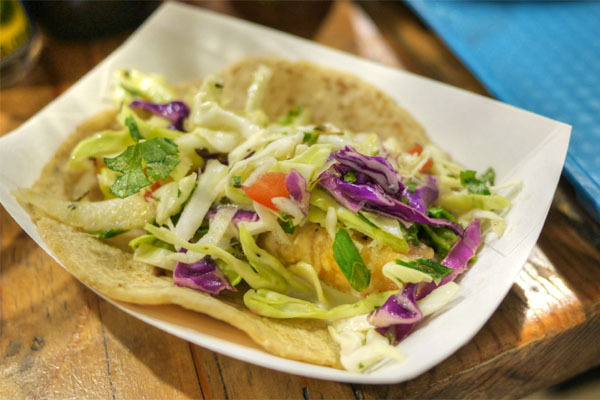 The scallop rendition of the taco was similar to the aforementioned fish, but the protein made for a suppler texture overall, with more apparent sweetness to it. 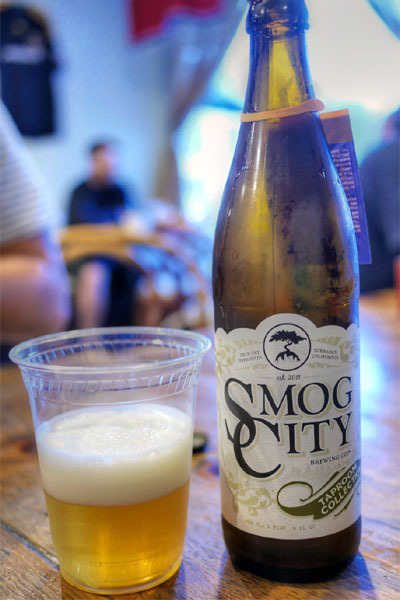 We BYOB'd it tonight with a couple bottles, the first being the new 2015 Smog City Kumquat Saison. This was definitely one of my favorite beers from the brewery, with its great kumquat-laced nose leading to a juicy palate loaded with more citrus and a pleasant, countervailing hoppiness. 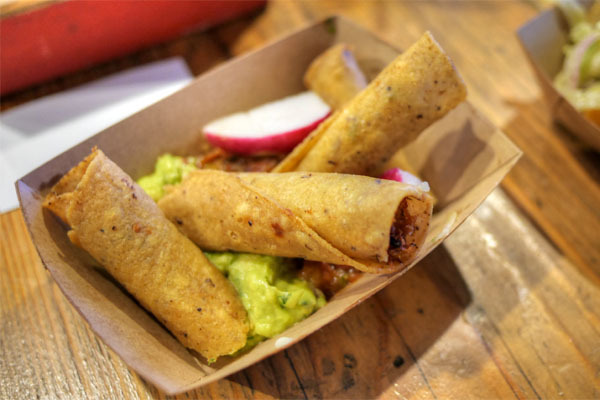 Punta Cabras was running a taquito special this evening, so we had to give 'em a try. I preferred the chicken version above, which really showed off the savoriness of the bird, beautifully paired with the guac and smoky salsa. Delish. A seafood cocktail brought together scallop and shrimp in a soupy lime-tomato broth with avocado and cucumber. It was actually one of the better preparations I've had, with great textures and freshness on the shellfish. I also appreciated how the kitchen didn't go overboard with the sweetness, as well as how the dish had a slight backbone of spice for that extra kick. 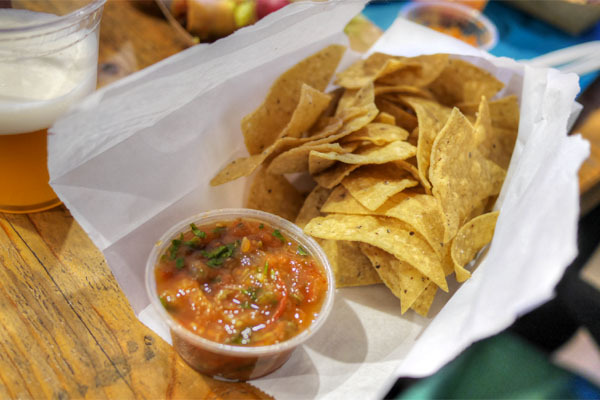 Chips and salsa got the job done, with a particularly nice consistency on the salsa part. The shrimp taco was perhaps my favorite of the four varieties. Great snappines here on the shrimp, which easily had the most intense brine of the seafood options. 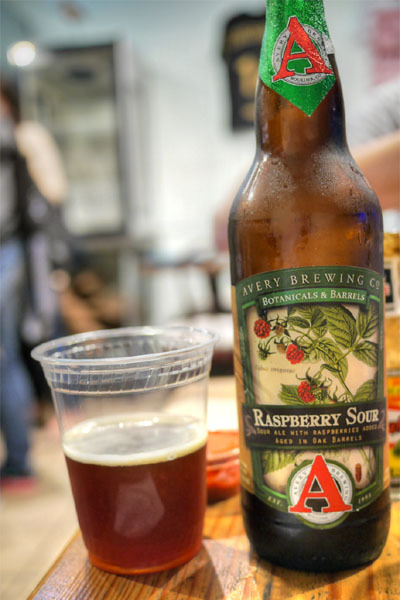 Our second beer was the 2015 Avery Raspberry Sour. This was a fun one: tart initially, but backed by a fruity, almost jammy sweetness and a whisper of earth. Very approachable for a sour. Beef taquitos worked well enough, though they had a sweet spice to them that I wasn't terribly keen on. I'd definitely go for the chicken. The tofu taco was another pleasant surprise, as I wouldn't immediately pick the protein out as tofu. Last up was the mixed tostada, another highlight. Superb textures and vibrancy on the shrimp and scallops here, and I loved how that all melded with the lushness of avocado and the brightness and acidity at play. 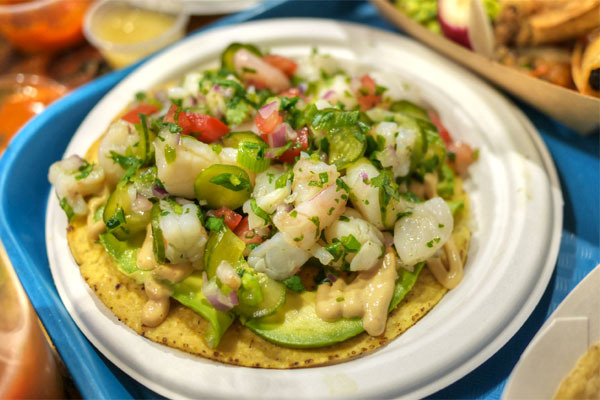 It looks like Gil and Snukal have done a pretty good job imparting a cheffy edge to Mexican seafood classics, giving us fun, familiar food executed with aplomb and some better-than-usual ingredients. 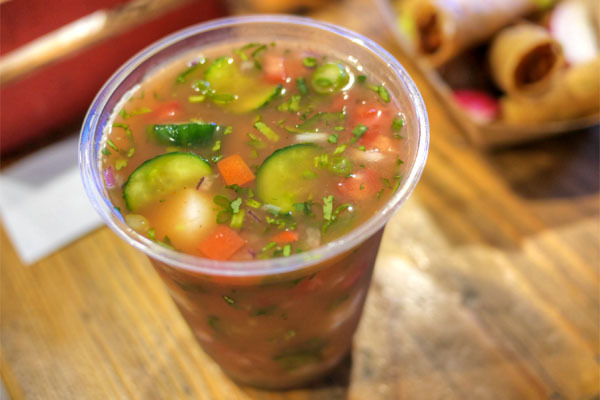 As a follow-up, they opened Hamburguesas Punta Cabras in Downtown, which dropped at the end of March in the old Mai Mexican Kitchen space. Their goal there was to do the same thing for burgers that they've done here for tacos, but the place shuttered in July before I could make it over. Apparently another location is in work, so be on the lookout for that. The pricing seems really low for the ingredients and the location. Hi Kevin, do you answer tweets directed at you? Hi Kevin, how do you BYOB at all these places? You did it here and Mondo and Pine and Crane. Do you they give you special permission? Or will they let any patron byob? thanks. A: Yeah it's not bad, a pleasant surprise given that we're talking about the Westside here. Anon: Sometimes, depends on my mood. Anon: I generally subscribe to the philosophy of asking for forgiveness rather than permission. I just go for it with the BYOB'ing, and try to be discreet.